The Pui Tak Center, located in Chicago’s Chinatown neighborhood, answers this call, according to Transition Services Coordinator Sandy Louie. The Chinese Christian Union Church founded the community center, located one block south of Pui Tak, on Wentworth Avenue. Nearly 800 students from 16 to 80 years old, attend free classes as part of their assimilation process. State and federal grants fund these classes. 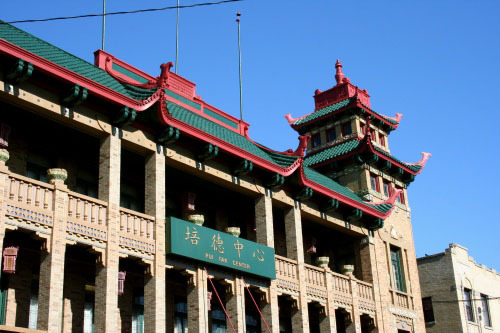 Chinese immigrants and other members of the community come to the center to learn the language and the skills needed to become productive members of society. An entire community exists in this unique section of Chicago, unto its own. However, the residents of this community are extremely positive, motivated and determined. “If you could put a computer chip in their head to help them learn faster, they would line up for it,” Louie said. The people who attend classes at the center are motivated to learn and do whatever it takes to succeed here in Chicago. Many Chinatown residents are first or second generation immigrants. Initially, they tend to lack the skills necessary to succeed here in the United States, such as a strong comprehension of the language. The Pui Tak Center allows students to attend ESL, job training and life skills classes. They offer classes starting at the basic level, taught by bilingual teachers, and working up to the advanced classes, where they only speak English. They can also take the citizenship class, which helps prepare them for the U.S. citizenship exam. Passing that test allows immigrants to become American citizens. “Finding a job is the finish line we strive for,” Louie said. Some even exceed that line to get further training at local colleges. For example, former students of the Pui Tak center have attended Harold Washington for their nursing assistant program and the American School for Cooking. To help these individuals the center started the Bridge Program, which is intended to “transition them across that bridge from ESL to work,” Louie said. The bridge program offers specialty courses that allow the students to focus their studies in the area of their interest. These tracks include citizenship, health care, hotel and hospitality, customer service, and adult basic education (A.B.E) courses. Learning English helps them communicate in interviews, and pass written tests to apply for professional positions. One student, Candy Song, attended the Bridge Program at Pui Tak and is now studying to get a license to become a registered nurse. Inspiring and encouraging their students to reach for more is the driving force behind the Pui Tak Center. “Aside from learning English, the people come to Pui Tak to make friends,” Louie said. The teachers who work for Pui Tak strive to provide one-on-one time for each student. They provide an adult tutoring program that is “more tailored to what the student needs,” Louie said.